ResumeWriting.com hasn't been around very long, however, the BBB thinks they're on the up and up. Also, I suspect that the people behind ResumeWriters.com and ResumeService.com have something to do with this start-up because I noticed if you go back in time on the wayback machine that they recommend ResumeWriters.com as a service while the site was under construction. I'm really excited about this business concept, as I'm in a difficult profession to write a resume for and I like that eventually when I try out this company that they'll pair me with a specialty writer. They're new, but I suspect that it has some of the industry's most experienced professionals behind it - thus the extensive network of writers. Being that they have an army of different specialty writers and are ready to pair you with the perfect professional, they pretty much cover the entire gamut of products. If you'd like to view some of their work, ResumeWriting.com has a comprehensive library of Sample Resumes for your review. Their pricing is right in-line with the industry average. In addition they offer an interview guarantee or they'll re-write the resume for free. 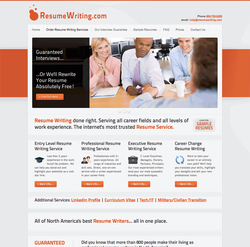 ResumeWriting is also affiliated with the Professional Association of Resume Writers and Career Directors International.